So tired. Is old age catching up with me? A planned twelve mile run on Sunday that in fact ended up as a half-marathon (13.1 miles) left me shattered. This morning I should have been up with the lark and out for a hill repetitions session, which usually I love, but I couldn’t face it. I begin to wonder whether a marathon in May is still a realistic target, and if I should not ask to switch to the half-marathon that runs in parallel with the Three Forts marathon. I shall not make a decision yet; this is the seventh week of sixteen weeks of training, but my mileage is worryingly low. At the end of next week I will be half way through. I will also be a year older, which may have something to do with this lack of will. This Oblomovism even infects my blogging, which I usually do while sitting down, so that I failed to post about my adventures on the Seven Sisters with the cream of Lewes running society, @Sweder and @RobKRead at the end of the week before last. You can read the former’s colourful account on the Running Commentary site, so I shan’t duplicate effort. It was bitterly cold on Sunday. I set off to do twelve miles. Looking at past runs, it seemed as if a journey taking in Bishopstone, Norton, Firle Bostal, Firle Beacon itself, Bo Peep and back to Seaford would accomplish the task. I set off along the sea-front, into the wind. Yet when I turned through 90 degrees to go inland, I was still running into the wind. I went through Bishopstone, where the snowdrops that usually cheer up a run at this time of year were closed and subdued. At the Norton waterworks the road turns into track and then path. I flogged myself up the hill towards Firle Bostal. At a farm a fierce small dog guarded a gate and snarled his hatred at me. His mistress came out of the house. ‘It’s your hat,’ she explained. I was damned if I was going to take my hat off, no matter how ridiculous, or provocative to small dogs it might be. I had half a mind to answer her in my best Yorkshire, ‘Nay, lass, tha dussn’t think I’m daft enough to go on t’Beacon bar t’at?’ Perhaps wisely I kept that to myself. On the tops of the downs, in spite of a base layer, a long sleeved t-shirt and a running jacket, I froze. Here the wind blew from the side. I saw few of the ramblers who usually infest this place. The Exmoor ponies stood stoically in a line in the lee of Firle Beacon. It was clear that I was going to overfulfill my quota; my Garmin was showing 7.5 miles at this point, and I was a mile away from Bo Peep, and I knew that from Bo Peep it’s about 4.5 miles to home. At least the last stretch was achieved with the wind at my back. I stumbled down the road to my house, arriving home 2:39:50 after leaving. It's the end of the fourth week, therefore the first quarter, of marathon training. After a good start to the week, I felt a little peculiar on Thursday and missed a four miler; furthermore, on Saturday, which should have been a swimming training day, I woke with excruciating pain in my left shoulder. It responded over the day to light movement and ibuprofen, to the extent that I tackled a ten mile run today. Conditions were poor, wet, windy and cold, and I went on a tour of the outskirts of Seaford, out to High and Over, up to Fiveways, a little further towards Bo Peep, and back to the seafront. By about three miles in my feet were so wet that it was futile to carry on trying to evade mud and puddles. The first race of 2013, and the first of the twenty that comprise the Sussex Grand Prix, is the Chichester Priory 10k. I had never run it before and, as it is my intention to enter such races this year, and as my marathon training programme called for a 10k round about this time of year, I entered without hesitation, although it is a 100 mile round trip. It is a very popular race, and the start in a car park by the Festival Theatre was thronged with runners and spectators. It is also uncompromisingly fast, to the extent that the officials stand down after an hour and a quarter. Fortunately I am not that slow yet. I joined a decent number of Striders, and assembled in my proper place, by the young man holding the 50-minutes-and-more placard. Then we were led forward to the start in the often-flooded College Lane. I observed that many of my fellow runners had chosen fluorescent outfits; for myself, I hoped to finish before dusk. As we shuffled forward, we came upon the starting mat, and off we went, up College Lane and through the grounds of Graylingwell, one of the massive mental hospitals that every city once had on its outskirts, then past the outskirts of Chichester and out into the country. As ever, I was going too fast in these early stages. Then we went out into the country around Goodwood, and turning west to head towards Lavant. A welcome cup of water was proffered at the half-way point, but it was here that the realisation that I'd failed to manage pace dawned. 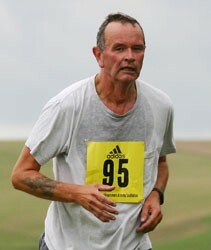 Other runners began to overtake me in embarrassing numbers. Then we were into Lavant, a pretty village, and turned south to go back to Chichester. Here traffic became a problem, exacerbated by some of my fellow headphone-wearing runners, whose lack of awareness of their surroundings became highly dangerous. I'm not doctrinaire about people who listen to music when they run; I'd rather hear the sounds of nature myself, but if you'd rather block out reality with the sound of Taiwanese acid-jazz or serialist string-quartets, be my guest. However, in this case I do wonder if race organisers shouldn't ban them; then again, who would they enforce it? I shall simply observe that you don't see Haile Gebrsellasie breaking world records with tunes stuck in his ears. The final section was made a little more difficult by the decision of the powers that be to dig up the road in honour of the race. We were directed onto a footpath, but it must have slowed the leading runners considerably. Then we turned by the Festival Theatre, and I barely had time to remember my acting career, giving my Bottom nightly in a Midsummer's Night's Dream, before I was running towards the finish. My chip time was 57:32. I know I can run faster; maybe after the marathon….